This San Francisco Singer is a seeker. She grew up at the nexus of two tectonic plates; close to a city known for its history of social, musical and political upheaval. These underlying conduits of tension seem bred into those from The Bay Area, but few more so than her. As a performer she wasn’t born until her twenties, though she remembers writing songs as a young child. Something in those early songs spoke to her future , illuminating a self that was yet to be. These days she is a vibrant artist carrying on the San Francisco tradition of powerful female singer/songwriters with literate lyrics and progressive musical attitudes; well respected within the music scene and increasingly so outside of it. The lid came off of her creative self during her studies at Colorado’s The Naropa Institute. 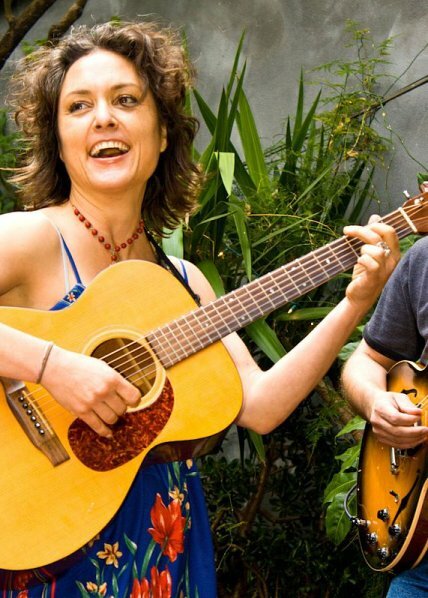 The ecumenical Buddhist-based educational philosophy of the school inspired this San Francisco Singer to take up Buddhist practice, begin studying yoga and to see her creative side as a spiritual outlet. Around the same time she experienced the Telluride Folk Festival, and was inspired to walk in the footsteps of artists such as Michelle Shocked and Shawn Colvin. Little did she know that she was embarking on a new life path. If yoga became the rock upon which her life was built, music became the lifeblood. Having built a worldview through the lens of opportunity and tragedy, this San Francisco Singer sees in her surroundings the opportunity to make the world a better place. She has lived through earthquakes, personal loss and even the 9/11 attacks in New York City. As a songwriter, she reflects the contradictions she sees in the world in song, unveiling in her lyrics truths that are simultaneously pragmatic and mystical. The Blues/Americana musical blend that is her canvas is simply the base from which her songs grow. Ultimately, her music is a cultural ecotone born of her California roots, her spiritual development, her transcendent instinct and the quest for enlightenment that is both of and divergent from the disparate influences that bore it.